This scene marks the end of an era of reverence for motherhood. The wearing of the “Mother’s Day Flower was an outward display of love, pride, respect and honor for the countless contributions of mothers, who were the glue that held the family structure together. The flowers were hand crafted in red for living and white for deceased mothers. On Mothers Day, no one, adult or child would be caught without a flower prominently displayed on their attire. 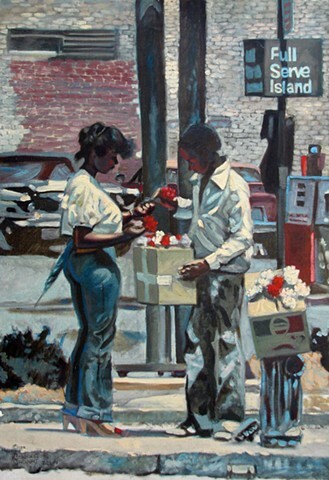 The young lady depicted here is purchasing a flower from a street vendor at Jefferson Ave. and Delmar Blvd. in St. Louis, MO, in the late 1970s.